Lodge Ceiling Lighting from LodgeCraft, will light up your room and bring the rustic style you are looking for. We carry a great selection of cabin, rustic, Tiffany and lodge ceiling lighting. 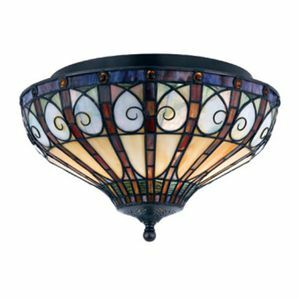 Our American Made ceiling fixtures and mounts have many finish and glass options to suit your discerning taste. Our art glass ceiling fixtures are made to the highest quality standards and imported. Whether you are looking for a flush mount, ceiling fixture, or a drop mount, we have a great selection of animal, western, distressed and other styles of rustic ceiling fixtures available online and in our Montana showrooms. Lantera Ceiling Mount - 14"